Android phones have taken the cellular market by storm. To add its charm to the Android line, Sony launched in January 2012, two new Android phones namely Sony Xperia U and Xperia P. At a glance, the Xperia P looks similarly designed and more appropriately a smaller version of the Xperia S. The former is Sony’s first smart phone to be assembled with WhiteMagic technology. The feature gives the handset the ability to outglow almost any smart phone in the market, in other words it gives the Xperia P an unmatchable outdoor visibility. Integrated with a 1GHz processor and an Exmor rear camera of 8 megapixels, the handset is as attractive shell made of anodized aluminum which protects the phone’s internals in the best manner which gives the phone a completely different feel and sets it different from the rest. With dimensions of 4.8×2.34×0.41 and a sleek size of 10.5mm, the handset is not too thick however not impressively thin either which makes it noticeable as it rests in your pocket. Due to the Xperia P’s 540×960 pixels and 275ppi pixel density, the handset exhibits an excellent level of detail which makes the tiniest fonts and icons look sharp and nice. Powered by Bravia graphics and running on dual core CPUs, Sony promises the phone will give a smooth experience of playing games and displaying content such as HD movies than any other Sony smart phones could offer. Although being tech savvy, the phone lacks a non removable battery and a microSD card slot which are the only tradeoffs associated with the design of Xperia P.
The Xperia U as compared to the Xperia P has a smaller screen of 3.5 inches with a lower resolution of 854×480 pixels. Like the Xperia P, this handset is also designed with near field communications (NFC) chips. This piece of Android is a lower mid range phone and is cheapest as compared to Xperia S and Xperia P. The transparent band, square cut and a plastic chin make it a look alike of the older versions of smart phones put forward by Sony. The strip bears icons for back, menu and home functions and refer to actual touch sensitive buttons above the strip. For a new user, this can be very confusing. The handset is designed to accommodate 16GB of onboard storage however Xperia U lacks the capacity for adding more. The phone gives an excellent balance between size, sharpness and rich colors. 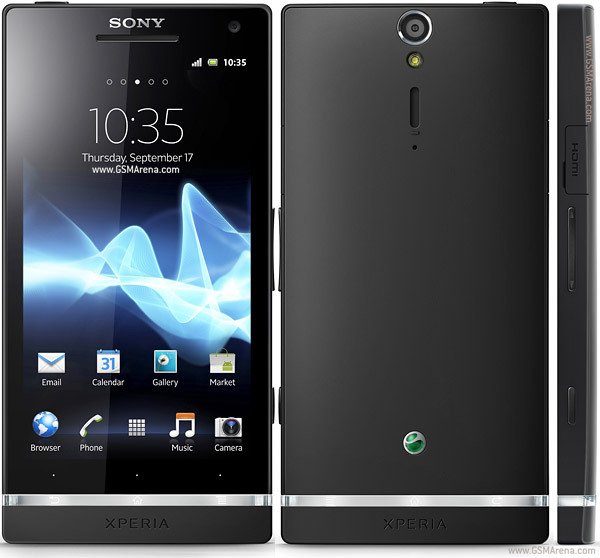 Xperia U comes packed with a 5 megapixel rear camera with LED flash. A front VGA camera is also integrated which makes the handset compatible for video chats. Both the Xperia U and P run on the Android 2.3 OS and have not yet been updated to the Ice Cream Sandwich which Sony claims will be updated soon. The phone is responsive, multitasking and gives a good browsing experience. A 1320 mAh battery gives the handset a great performance battery wise. A low to moderate user can easily pass a day to day and half with charging it once. Both the Xperia phones are interesting handsets and can prove to be great for those who do not require memory expansions.